The Genesis by YoYoFactory is the signature yo-yo of Miguel Correa. It takes design cues from the Grind Machine 2 and SuperStar and combines them to make a massive, rim-weighted yo-yo. It doesn&apos;t have any hubstacks like the Boss, to cut down on center-weight, and cost. The Genesis has always been a crowd favorite in the YoYoFactory lineup. It&apos;s a powerful competition level yo-yo. 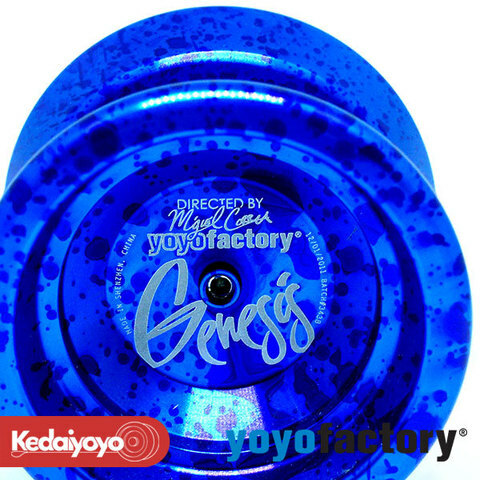 YoYoFactory is continuously redesigning and tweaking their favorite yo-yos to bring them up to the standards of modern competitive play, and this latest version of the Genesis is serious competitor! The signature Genesis H-shape already screams stability and spin time, but with the more angled profile and redistributed weight you&apos;re going to feel a whole new monster. This yo-yo is as fast and maneuverable as it is stable! Maximum stability, maximum spin, and maximum performance - That&apos;s what the Genesis brings to the table. The Genesis was made to perform and that&apos;s what it does!